Victoria’s Minister for Creative Industries Martin Foley was welcomed to The Ian Potter Southbank Centre today, with a performance by Conservatorium brass students Hannah Rundell, Natalia Edwards and Kiran Samuel. 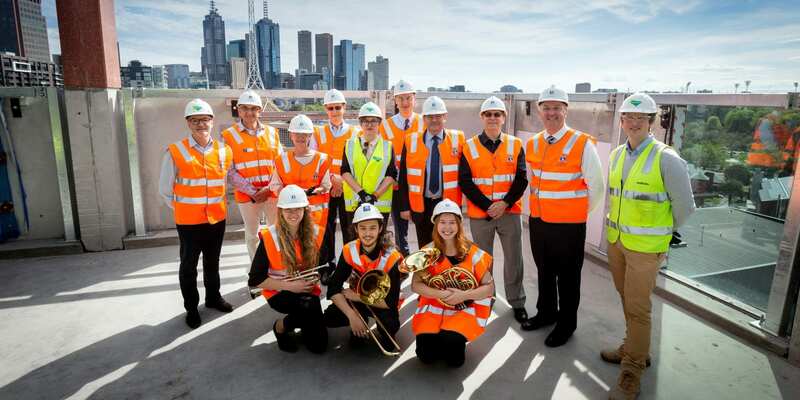 The University of Melbourne’s Ian Potter Southbank Centre today opened for a sneak peek by Victoria’s Creative Industries Minister Martin Foley. 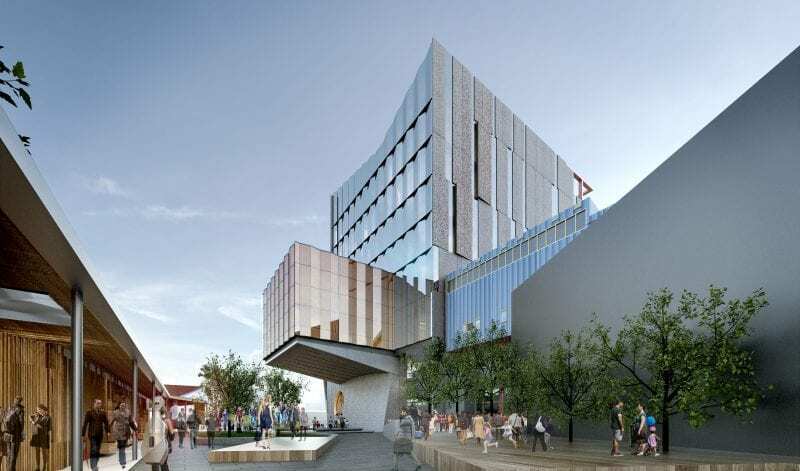 The new $109 million building will be home to the Melbourne Conservatorium of Music, part of the Faculty of Fine Arts and Music, when it officially opens to staff and students in February next year. The Conservatorium sits within Melbourne’s Arts Precinct, one of the strongest concentrations of arts and cultural organisations in the world. 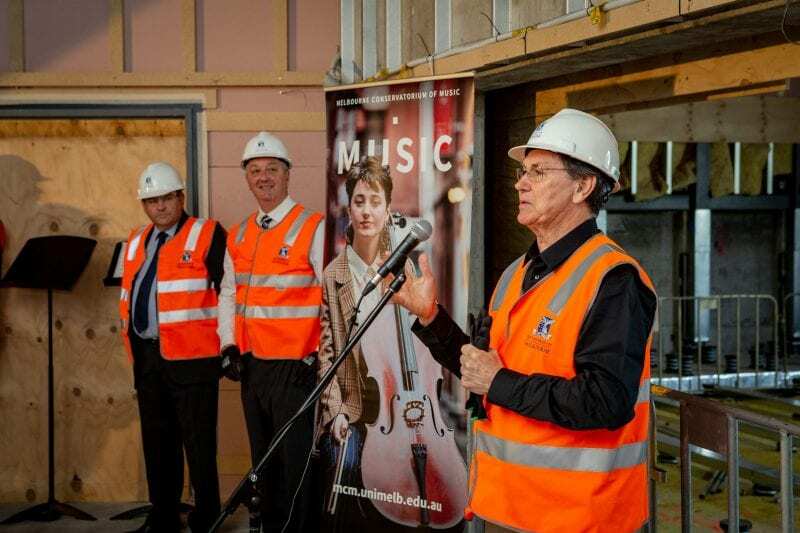 Mr Foley said: “The Melbourne Conservatorium of Music is a stunning addition to our arts precinct and an important investment in our creative talent and the future of our creative state. L-R: University of Melbourne Vice-Chancellor Professor Duncan Maskell and Victoria’s Minister for Creative Industries Martin Foley watch on as Faculty of Fine Arts and Music Dean Professor Barry Conyngham addresses the media at The Ian Potter Southbank Centre. By Sav Schulman. The Faculty of Fine Arts and Music, which has had a 64% increase in student attendance since 2010, has invested $200 million in redeveloping the Southbank campus to offer world-class facilities to the growing student cohort. Artist’s impression of The Ian Potter Southbank Centre, courtesy of John Wardle Architects. Faculty of Fine Arts and Music Dean Professor Barry Conyngham said: “The transformation of our Southbank campus offers tremendous facilities to our students as well as opportunities to deepen our engagement with the community. Artist’s impression of The Ian Potter Southbank Centre, cross-section, courtesy of John Wardle Architects. 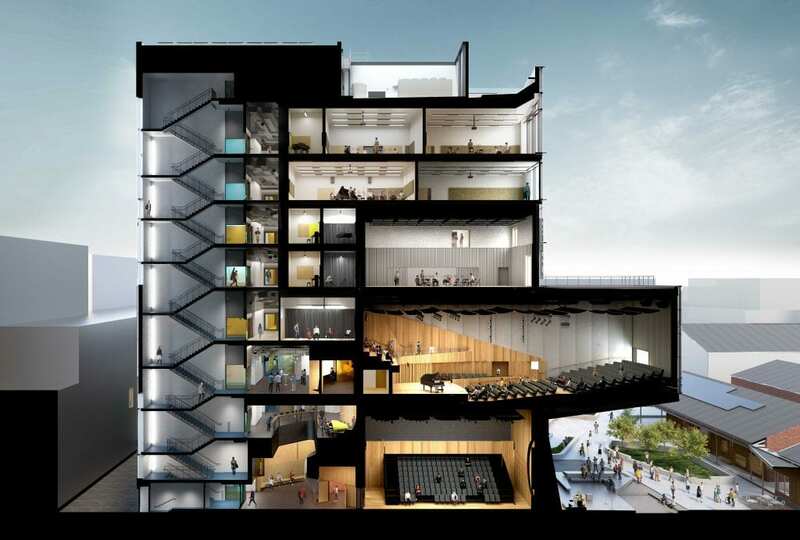 Audiences and students alike will benefit from the Conservatorium’s world-leading acoustic spaces, enabling a rock band playing at full volume to remain unheard by a string quartet in the room next door. 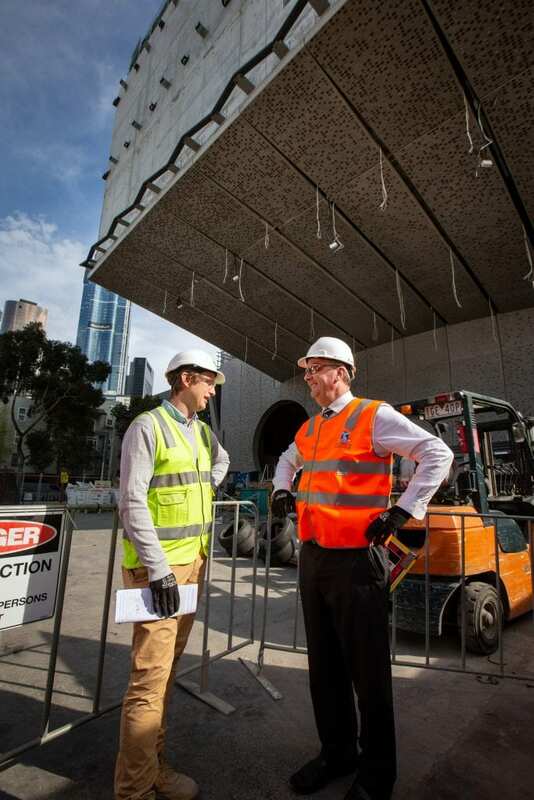 Lendlease Construction Manager Nat Gray and Victoria’s Minister for Creative Industries Martin Foley discuss The Ian Potter Southbank Centre under the building’s cantilever. By Sav Schulman. John Wardle Architects designed the Conservatorium, which is being constructed by Lendlease. The building will host one of the world’s largest oculus windows, with a six-metre diameter. The oculus will provide a window through which people walking in the Arts Precinct can watch music rehearsals taking place in the 200-seat ground-floor studio. The Conservatorium also includes a 400-seat cantilevered auditorium and rehearsal spaces for teaching, performing, recording and research. Building acoustics based on box-in-box construction, designed to insulate the Conservatorium from external sound sources such as trams. Rehearsal spaces include 12 tutorial rooms, designed for rehearsals for 12–20 musicians. Small studios for rehearsals of up to three musicians. Flexible acoustic design. Studio 2 is a flexible flat-floor performance and rehearsal venue, accommodating up to 135 people, with acoustic performance designed for professional recording capability. Music Workshop, the main performance and lecture space, accommodates up to 40 musicians on stage, a choral balcony for 60 choristers and audience seating for up to 400 people. Student hub and performance space foyer for study and event use. Seating designed for flexible use of space. Informal study and meeting spaces. Studio 1 accommodates a 120-piece orchestra for rehearsals, with a 200-seat retractable seating bank for performances, recitals and guest lectures. Multiple window portals, including a 6-metre-diameter oculus window. Read the original University of Melbourne media release on The Melbourne Newsroom. Read more about the Southbank campus developments. Read more about the Melbourne Conservatorium of Music. Banner image: L-R back row: Architect John Wardle,Victorian College of the Arts Director Professor Jon Cattapan, Faculty of Fine Arts and Music Executive Director Jane Richards, Melbourne Conservatorium of Music Director Professor Gary McPherson, JWA architect Meaghan Dwyer, Chair of The Myer Foundation Martyn Myer, University of Melbourne Vice-Chancellor Professor Duncan Maskell, Dean of the Faculty of Fine Arts and Music Professor Barry Conyngham, Victoria’s Minister for Creative Industries Martin Foley, Lendlease Construction Manager Nat Gray, with (L-R) front row: Melbourne Conservatorium brass students Hannah Rundell, Kiran Samuel and Natalia Edwards on the roof of The Ian Potter Southbank Centre. By Sav Schulman.